I glanced at the clock on the score board. The score was tied, and the bright red lights on the board glowed with the fearful number of five seconds. I got the ball and quickly passed it to David F. who pushed and maneuvered himself all the way to the hoop. The J.V. White team had won with only five seconds left on the clock! We all huddled together and congratulated David on the amazing layup as well as the other members of the team for all working together. Our team lined up to shake the opponents’ hands and to thank them for helping our team improve. We were so happy to earn a win in the final seconds of the game. 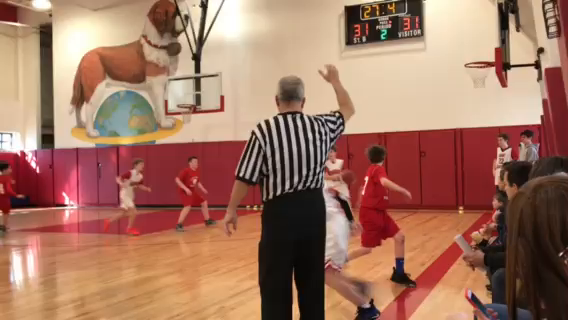 This was one of many dramatic moments in the 17th Annual St. Bernard’s Basketball Tournament on Saturday, January 26. The tournament was full of joy, happiness, and hard work. When I spoke to Coach Silver after the exciting weekend, he said that every single team played their best, and that the St. Bernard’s teams are beyond what he thought they were going to be at the beginning of the school year. Congratulations to J.V. White, Red, Navy, and Royal teams! We thank the team coaches, the maintenance department, our supporters, and a special thanks to Coach Miceli who has helped bring everyone together for so many years. The boys of St. David’s, Buckley, and St. Bernard’s all played their best and kept in mind good sportsmanship.